SCOTTIE Thompson was inconsolable after ending an impressive college career with Perpetual Help with a disappointing loss to Letran on Friday night. The Altas star sat alone on the bench, a towel wrapped around his head as the final seconds ticked away in a lopsided 64-93 loss to the Knights that put a premature end to Perpetual's season in the NCAA. The frustration was understandable after Thompson and Co., who had looked as shoo-ins to the Final Four, lost a third straight game and ended up becoming the odd team out in a six-team race. Worse, Thompson, who routinely dished off triple-double performances this season, was helpless to save the Altas after a torrid start opened a big lead for the Knights. Ginebra's first-round pick in the last PBA rookie draft, the stocky guard finished with seven points, eight rebounds, and four assists - a far cry from the numbers 'Mr. Triple Double' used to dish out in his final college season. He shot just 2-of-11 from the field. With the outcome beyond doubt, the former league MVP was pulled ou of the game by Altas coach Aric del Rosario and sat forlornly on the bench, a tower draped over his head as he sobbed unabashedly. Greener pastures now awaits Thompson, who is expected to join Barangay Ginebra’s practices anytime soon. But not even chants of 'Ginebra, Ginebra' from the Altas gallery could soothe the pain. 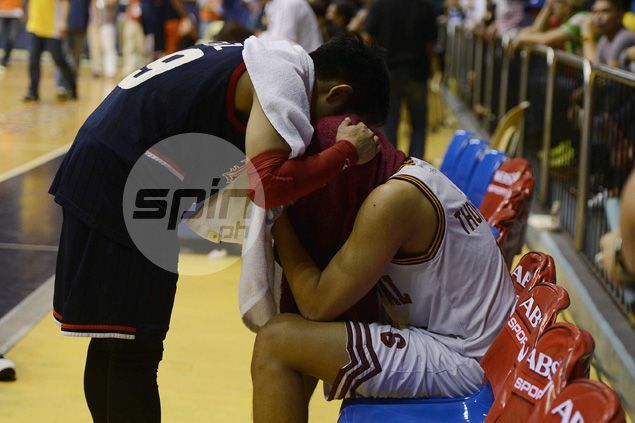 Thompson sat there sobbing as he was comforted by Letran star Mark Cruz - a Purefoods draftee who may soon be his opponent in the PBA - and later politely declined interview requests from the media. The pain was obviously too much to bear.